Como falo em inglês: Quase caí da cadeira! Hey, everybody. O episódio de hoje fala sobre duas expressões em inglês com as palavras chair (cadeira) e seat (assento). Hi, what’s up? Today we have a new episode of the inglesonline podcast. Please subscribe to this podcast using the Podcasts app for iPhone or iPad, or listen to the episodes using the Inglesonline Android app. To download or just listen to other episodes and download transcripts, go to inglesonline.com.br and click Podcast Inglesonline. So let’s start with the expression in the title. People say that in Brazil when they’re very surprised at something; when they’re caught by surprise, when something surprises them to the point they nearly fall off their chair. Of course, we use that metaphorically, right? When we say that, it usually does not mean that we actually nearly fell off the chair. It’s a metaphor and we use it to emphasise our surprise at something. Same thing in English. So here’s the expression again: I nearly fell off my chair; or another way people say that – I almost fell off my chair. Nearly means the same as almost here. So I’m trying to remember the last time something caught me by surprise and made me nearly fall off my chair. And, you know… I can’t. Really, I can’t remember anything recently that made me fall off my chair. I’m sure many of you will have good examples. Come on! Tells us your stories. 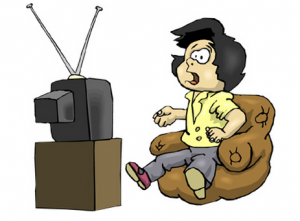 Maybe it was some news, maybe something you saw on TV… What was it that made you nearly fall off your chair? Now think of the most gripping, most thrilling, most suspenseful movies you’ve watched lately. Are you a fan of horror movies? A good horror movie can sometimes keep you on the edge of your seat. That is the opposite of being relaxed in your seat. Sometimes you’re watching something relaxing on TV, like a music concert and you’re relaxed, you’re having a beer and enjoying the music… Well, this expression communicates kind of the opposite. When you’re on the edge of your seat, your eyes are probably glued to the screen. Your attention is completely focused on the movie; you may be a little nervous or your heart may be pounding a little bit. You’re just waiting to see what’s gonna happen next, and next, and next… You’re on the edge of your seat. I have my own example for this: when I watched the movie Speed for the first time, I was on the edge of my seat for most of the movie. Who knows which movie I’m talking about? It’s pretty old and stars Sandra Bullock and Keanu Reeves. The title in Brazil is ‘Velocidade Máxima’. And there’s another film I’ve watched recently, and Sandra Bullock is in it again… It’s called Gravity, and this film kept me on the edge of my seat. Pretty gripping and full of action. I think no one’s gonna have a problem finding examples for this one. Movies nowadays are so full of action, explosions, suspense and so on. So what are your examples? What are the movies you’ve watched recently that kept you on the edge of your seat? Let us know in the comments and talk to you next time! Hi, Ana! I just arrived from Buenos Aires, and something made me fall of my chair there.The behavior of the people in the line of the bus.People there are so much gentle to each other, completely different from brazilian people.That surprise me a lot.Kisses!! Nice example. I know what you’re talking about- I’ve seen “strange” behaviors abroad that almost made me fall off my chair. I like and you for having given us so much. I think it is good way for learn solid inglis language. I’d like to thank you for having given us so much knowledge of the English language. I wish you the greatest success in life. May God watch over you always!!! Sometimes some news make me fall off my chair, like parents killing children, children killing their parents and relatives. Oh Gosh! it really makes me fall off my chair! I don’t like horror filmes, but suspense. And I old movie that kept me on the edge of my seat was Aliens. Pretty gripping and full of suspense!! Today I do not have anything to tell you that makes me fall off my chair; maybe I don’t remember now. But I have a film that I saw in the past which made me on the edge of my seat! “TITANIC”. You see!? Thanks Ann for your podcasts; they are gonna be very useful for me. Intersting that i can not say …MADE ME FALL OFF (…) i just wañna say MADE ME TO FALL or FALLING OFF (…). Anyway thanks for everythyng. Exelent job, see you. Bye!